Following is a tentative schedule of 2019 Purina Series Events. Check Upcoming coonhound events in for confirmed dates, locations, fees and entry deadlines. 38th Annual Purina Outstanding UKC Nite Hunt Coonhound Series FINAL Standing. Nestle Purina PetCare, in conjunction with the United Kennel Club, established the Purina Award for the Outstanding UKC Nite Hunt Coonhound of the Year. Purina recognizes the immense interest in the sport of Coonhound Nite Hunt competition and the tremendous amount of time spent by competitors in working with and training their dogs. The Purina Outstanding UKC Nite Hunt Award was established to honor the country’s outstanding coonhound and give recognition to the owner and handler. Purina recognizes the immense interest in the sport of Coonhound Nite Hunt competition and the tremendous amount of time spent by competitors in working with and training their dogs. The Purina Outstanding UKC Nite Hunt Award was established to honor the countrys outstanding coonhound and give recognition to the owner and handler. The Purina Series has been an integral part of UKCs coonhound program for nearly four decades. The honor and recognition it has brought to its winners and the sport throughout those years is paramount, and is something Purina is very proud of. The format has, for the most part, remained basically the same up to this point. However, as times change so does the climate of the sport and the expectations of its participants. The Purina Committee has recognized this need for change and is proud to offer the following new and improved format for this most prestigious program. Beginning January 1, 2019, Purina Points events will serve as qualifying events for dogs to earn eligibility to represent their breed at the National Championship, where breed winners and the Outstanding Coonhound of the Year will be determined. The Purina Outstanding Coonhound Award Committee has the final decision in all matters pertaining to the programs operation. The Committee reserves the right to, during the calendar year, make any changes deemed necessary to any part of rules, schedule or otherwise. Any such changes are announced on the UKC website, www.ukcdogs.com. The Committee reserves the right to audit and approve the final tabulated scores, and to announce those coonhounds qualified for the National Championship. Whenever possible, Purina Outstanding Coonhound Award Committee members participate at the official presentation of awards. All dogs entering one of the Purina Awards Committee-selected UKC Licensed Nite Hunts must be registered with the United Kennel Club. The event will be run in accordance with UKCs rules and policies, the UKC Nite Hunt Honor Rules in effect for the year the selected event is being run. All dogs drawn in any one, several, or all, of the events included in the Purina Award Program, as selected by the Purina Award Committee, shall be eligible for the points applicable to the Purina Award unless indicated otherwise. The competition will begin January 1, 2019 and end December 31, 2019. To earn points, a dog must hunt in its correct category the full time specified and be a cast winner with a total score of plus points. The program shall consist of carefully selected UKC Licensed events and will be advertised as Purina Points Events. The events selected will provide a true test of a coonhounds ability to perform during a UKC Licensed Nite Hunt. Each event selected is recognized for its prestige and organization. The Purina Committee has selected the following events to serve as a Purina Points Events, pending confirmation by the event organizers as same. Participants should refer to the UKC website at www.ukcdogs.com for any updates or changes to the Purina Points Event schedule. Refer to the Upcoming Events listing in Coonhound Bloodlines and on the UKC website for confirmation, dates, deadlines and fees. *Denotes Bonus Points Events with specific information provided below. All cast winners with a total score of plus points receive 10 Purina points. No additional points awarded unless otherwise indicated. The Purina Committee has the right to review any and all complaints or UKC Appeals brought from or about any owner or handler, and act accordingly. The Purina Committee has the authority to revoke Purina Points from any dog. The Purina Committee has the authority to indicate any dog, owner, or handler as ineligible to earn Purina Points. Note: Purina Points may be withheld if it is determined that a cast win is the result of another hound withdrawing from the cast. Note: Purina points are awarded one time only to dogs who win their cast at any World Championship Qualifying Event. Purina Points are not awarded at licensed Youth Championship events that may be held in conjunction with a Purina Points Event. The U.S. and Canada are divided into four separate regions. The region designated to a dog is based on the registrants address (sole signatory) on record, as of January 1, 2019, at United Kennel Club. All Canadian participants are assigned to the Northeast Region. Dogs may earn points at any Purina Points Event and in any region. The points earned are recorded in the region as designated for that dog. The Purina Points of any dog transferring ownership during the calendar year will be recorded and remain in the region the dog was registered to on January 1 of that year. A monthly standing will be generated using UKCs official records of wins and published in Coonhound Bloodlines magazine and posted on the UKC website. It will be kept current as reports of winners of each Purina Points Events are made a matter of record in the permanent files of the United Kennel Club Registration Office. Clubs hosting Purina Points Events must submit all scorecards along with the reports to UKC for filing. At the close of each year, the Award Committee will audit the tabulated points received from the United Kennel Club, and members of the Award Committee will issue a statement announcing those coonhounds eligible to represent their breed at the National Championship. Participants are reminded to conduct themselves professionally at all Purina Points events. The Purina Committee will review any allegations of unethical practices demonstrated by a participant. The committee, in its sole judgement, has the authority to revoke Purina points from any dog. The committee has the authority to indicate any dog, owner, or handler as ineligible to earn points at any time and/or during any time. The National Championship features up to 16 coonhounds of each breed. The four coonhounds, comprised of each of the seven UKC recognized breeds who earned the most points in their designated region the previous calendar year, are qualified for the National Championship. The National Championship is generally held on the last weekend in April at a location determined by the Purina Committee. The dog who earned their ending total amount of points first. The dog who has the highest combined cast wins score. The dog who actively participated in the most Purina Points Events throughout the year. UKC tie-breaker rules using total scores of all cast wins combined. THE NATIONAL CHAMPIONSHIP FEATURES FOUR ROUNDS OF COMPETITION, USING CHAMPIONSHIP RULES AS THEY APPLY TO NITE AND GRAND NITE CHAMPIONS. ALL ROUNDS WILL HUNT FOR 90 MINUTES. Round 1: (Early Round) This round features up to 16 contenders of each breed. Dogs will be drawn out within their own breed only in this round. Hunting Judges will be used in this round. All plus-point cast winners advance to the next round. Any cast not having a total score of plus points will not have a dog advance from that cast. Exception: In the event no dogs in this round have a total score of plus points, the dog with the best score will advance to Round 3. Round 2: (Late Round) Dogs will again be drawn out within their own breed only in this round. Using Hunting or Non-Hunting Judges in this round will be determined by the Purina Committee. UKC Slam Event rules, as it pertains to the Final Cast (a total score of plus points is not required), are applicable in this round and throughout all remaining subsequent rounds of the National Championship. Unbreakable ties revert back to previous round scores. Round 3: (Early Round) The Semifinals will feature four heads-up matches. The seven winners of Round 2, along with one wildcard, will make up the eight contenders in this round. The wildcard is the dog who earned the most Purina Points the previous year who receives a bye into this round. The wildcard will be drawn out with the other dog of its breed in this round. Otherwise, dogs will be drawn out randomly into four casts in this round. Cast winners will advance to the Final Round. Any cast in this round, where all dogs are scratched, will not have a dog advance to the Final Cast. Unbreakable ties revert back to previous round scores. Non-Hunting Judges will be utilized in this round. Round 4: (Late Round) This is the Final Cast. A Non-Hunting Judge, along with an Assistant Judge, will be used in this round. Unbreakable ties revert back to previous round scores. The Winner of this cast will be named the UKC Outstanding Coonhound of the Year. -(Includes breed winner purse), original oil portrait of the winning coonhound, and a twelve (12) month supply of feed. Total potential prize package valued at $7,160. -Six (6) month supply of feed. Total potential prize package for each dog valued at $1,252. Total potential prize package valued at $2,252. Total potential Awards Package valued at $24,428. Note: *Verification through a feeding affidavit form required of all winners. Otherwise, the cash award for that dog will be cut in half. Recipients of awards are solely responsible for any and all federal, state and local taxes. THE PURINA OUTSTANDING UKC NITE HUNT COONHOUND AWARD WINNER WILL RECEIVE AN ORIGINAL OIL PORTRAIT OF THE WINNING HOUND. Nestle Purina PetCare is honored to have a part in this prestigious program and to lend its name to this award. Participation in the program and announcement of the winner should in no way be construed as an endorsement or testimonial for Purina Dog Foods. Purina simply makes it possible for outstanding coonhounds to receive recognition they so richly deserved. May the best dog win! A public announcement of the winner of the Purina Award will be made in the Coonhound Bloodlines magazine and on the UKC website and will be considered official and final. Time and place of the Award Ceremony will be announced. For further information, write: Mark Cascio, c/o Gail Inman 12T, 1 Checkerboard Square, St Louis MO 63164. If the registered owner or co-owner of a UKC registered Coonhound is barred or suspended from UKC, he/she shall be ineligible to participate in the Purina Nite Hunt Award Program for the entire period of barment or suspension. All Purina Points earned by a dog owned or co-owned by a person who is barred or suspended during any calendar year shall be forfeited. In the event such a dog is sold to an owner or co-owners who are eligible to participate in this program, the dog will remain ineligible to earn Purina Points until January of the year following the suspension or barment of the previous owner(s). Nestle Purina PetCare, in conjunction with the United Kennel Club, established the Purina Award for the Outstanding UKC Bench Show Coonhound. Purina recognizes the immense interest in the sport of Coonhound Bench Show competition and the tremendous amount of time spent by competitors in conditioning and training their dogs. The Purina Outstanding UKC Bench Show Award was established to honor the countrys Outstanding Bench Show Coonhound and give recognition to the owner and handler. Purina provides awards and hosts the Award Ceremony for the Purina Outstanding UKC Bench Show Coonhound program. The program is administered by the Purina Award Committee, made up of seven prominent and experienced individuals representing each of the seven UKC recognized coonhound breeds as follows. The Purina Outstanding Coonhound Award Committee has the final decision in all matters pertaining to the programs operation. The Committee reserves the right to, during the calendar year, make any changes deemed necessary to any part of rules, the schedule or otherwise. Any such changes are an-nounced on the UKC website, www.ukcdogs.com. The Committee reserves the right to audit and ap-prove the final tabulated scores and announce the winning coonhounds. Whenever possible, Purina Outstanding Coonhound Award Committee members participate at the official presentation of awards. All dogs entering one of the Purina Awards Committee-selected UKC Licensed Bench Shows must be registered with the United Kennel Club and compete in the proper category: Registered, Show Cham-pion or Grand Show Champion. The event will be run in accordance with UKC rules and policies, the UKC Coonhound Bench Show Rules or the UKC World Show Championship Rules in effect for the year the selected event is being run. All dogs shown in any one, several or all of the events included in the Purina Award Program, as se-lected by the Purina Award Committee, shall be eligible for the points applicable. The competition will begin January 1, 2019 and end December 31, 2019. To earn points, a dog must compete in their proper category at selected and advertised Purina Points Events. Each event selected is recognized for its prestige and organization. dogs.com for any updates or changes to the Purina Points Event schedule. Refer to the Upcoming Events listing in Coonhound Bloodlines and on the UKC website for confirmation, dates, deadlines and fees. While it is not necessary for the dog to compete in all of the above listed events, they are the only ones at which points may be earned. Note: Purina points are awarded one time only to dogs who win their category at any World Champi-onship Qualifying Event. Purina Points are not awarded at licensed Youth Championship events that may be held in conjunction with a Purina Points Event. The U.S. and Canada are divided into four separate regions. The region designated to a dog is based on the registrants address (sole signatory) on record, as of January 1, 2019, at United Kennel Club. 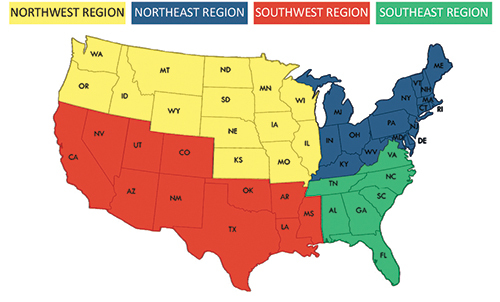 All Ca-nadian participants are assigned to the Northeast Region. A monthly standing will be generated using UKCs official records of wins and published in Coonhound Bloodlines magazine and posted on the UKC website. 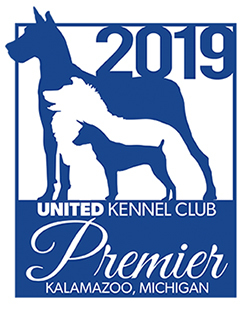 It will be kept current as reports of winners of each Purina Points Events are made a matter of record in the permanent files of the United Kennel Club Registration Office. Purina Points Event administrators and organizers shall be selective and only assign individuals who are UKC Licensed, capable, well qualified, and knowledgeable of all coonhound breed standards. The judge should be well versed on movement, and structure and anatomy. An individual may judge one Purina Points show only during the calendar year. They must decline any additional Purina Points Event judging propositions, with exception to any of the UKC Chartered Breed Day bench shows and the three UKC administered Purina Points Event (Autumn Oaks, Winter Classic, World Championship and/or RQE). Participants are reminded to conduct themselves professionally and appropriately at all Purina Points Events. They shall play no role in selecting the judge(s) for an event in which they are also participating in. The Purina Committee will review any written complaints of unethical practices or unsportsmanlike conduct allegedly demonstrated by any judge or participant. The committee has the authority to re-voke Purina Points from a dog whose owner or handler is found involved in any action deemed detri-mental to the series. Any dog, owner, or handler may be indicated as ineligible to earn Purina Points throughout any part or all of the calendar year, as determined by the Purina Committee. The National Championship features up to 16 coonhounds of each breed. The four coonhounds, com-prised of each of the seven UKC recognized breeds, who earned the most points in their designated region the previous calendar year, are qualified for the National Championship. The National Champi-onship is generally held on the last weekend in April at a location determined by the Purina Commit-tee. The dog with the most category wins. The dog who defeated the most dogs at those events where points were earned. All dogs involved are eligible to advance to the National Championship. THE NATIONAL CHAMPIONSHIP FEATURES A UNIQUE THREE-JUDGE PANEL WHERE EACH DOG IS JUDGED INDIVIDUALLY BY EACH JUDGE IN SEPARATE RINGS. In Round 1 all dogs will be individually judged by three judges in no specific order other than by breed. Each dog will be given an evaluated score by each of the three judges. A combined score (3) will be the dogs total score, by which the breed winner is determined. The Finals will consist of the seven breed winners. Each dog will again be judged individually by each judge. The highest combined score will determine the winner, who will be named the UKC Outstanding Bench Show Coonhound of the Year. -Includes breed winner purse, original oil portrait of the winning coonhound, and a twelve (12) month supply of feed. Total potential prize package valued at $1,252 for each dog. Total potential Awards Package valued at $11,672. A public announcement of the winner of the Purina Award will be made in Coonhound Bloodlines magazine, and on the UKC website, and will be considered official and final. Time and place of the Award Ceremony will be announced. For further information, write to Mark Cascio, c/o Gail Inman 8T, 1 Checkerboard Square, St Louis MO 63164. If the registered owner or co-owner of a UKC registered Coonhound is barred or suspended from UKC, he/she shall be ineligible to participate in the Purina Bench Show Award Program for the entire period of barment or suspension. All Purina Points earned by a dog owned or co-owned by a person who is barred or suspended during any calendar year shall be forfeited. In the event such a dog is sold to an owner or co-owners who are eligible to participate in this program, the dog will remain ineligible to earn Purina Points until January of the year following the suspension or barment of the previous owner(s).